Cloudflare recently came into Domain Registrar Business and they're probably the best when it comes to pricing. Why? No markup. No surprise fees." Apparently, there is not much of a service you need once you registered a domain and it pointing to right name servers. Now in order to transfer your domain from a different registrar to CloudFlare, you need to open the dashboard on your current registrar and make sure there is no Registrar-Lock on your domain. 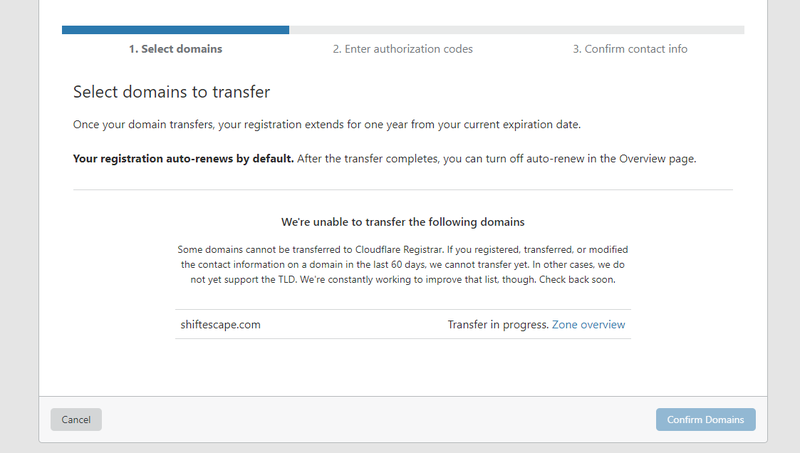 Once confirmed you'll need to get an EPP Code which you'll be entering in the CloudFlare panel where you transfer a domain. Now when transferring a domain you need to make sure your domain is supported by CloudFlare. To check that head to TLD Policies by CloudFlare here. For anyone concerned .in domains don't come in this policy yet. So if you're having trouble transferring a .in domain to CloudFlare there is no way to do it as of now. Once you see Transfer in progress all you can do is wait. It could take up to 14 days for the transfer to complete.